I bought the Seiko SGEG74P2 in Tokyo back in 2013 and it is my go-to watch ever since. This is part 3 of my Amateur’s Review series on Reddit – I would just like to thank everyone who spent the time reading my posts and bearing with my awful writing. If interested please take a look at part 1 and part 2 respectively. This cannot be an amateur review without my disclaimer: my knowledge on watches is a work in progress as is my writing. If you have any recommendations on what I should touch up on please leave a comment or shoot me an email! The Seiko SGEG74P2 was one of my first personal and proudest purchases. I did next to no research and just wanted a simple, elegant watch. Back then all I knew about watches was not get it from clothing brands – something my father and grandfather always said. I love wearing this watch because no one has it(back in Vancouver at least), and I receive many compliments on it. The following were the pros and cons that went through my head prior to the purchase. Due to my slender and feminine wrists, the relatively small face size of the watch is ideal for me. Japanese brand, very subjective but being raised and influenced by my parents(who were from Taiwan, an once Japanese colony) I was strictly looking for a Japanese watch. Not your average Seiko look. A quartz watch – I had no idea what that meant back then I just knew automatic was more expensive and thought that was better. If you are a fan of leather straps(oh dear), timeless style and (don’t mind)Japanese quartz this watch will come highly recommended by me. 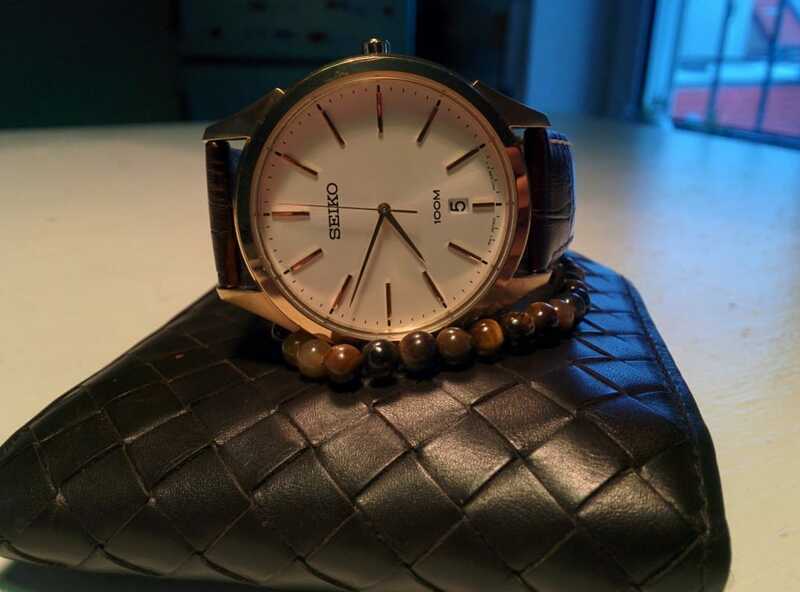 With the Seiko SGEG74P2, the company offers a reliable, reasonably priced watch with classical features and versatility that can surely woo a large majority of people. If you are like me and are looking for a simplistic watch that is not a Daniel Wellington or Orient please consider this watch. or find other Seiko watches of similar style .